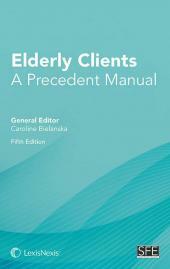 Elderly Clients: A Precedent Manual provides a wealth of precedents to assist the private client adviser tackle the whole range of issues affecting the elder client. These include the difficult and ever-changing problems of planning for a client’s possible incapacity in later life, care contracts, funeral planning, wills and equity release schemes. In addition to the precedents, the legal framework underpinning each area is set out in clear terms and is accompanied by useful checklists to assist the adviser in such matters as registering a lasting power of attorney and establishing whether the client has authority to make a will or gift. A CD-ROM containing all of the precedents is included enabling you to quickly tailor each to suit your particular needs. Caroline is the former Chief Executive and former Chair of Solicitors for the Elderly, an organisation she helped to found in 1999. She lectures regularly and is well known in her specialist field, advising older and vulnerable adults who have limited physical and/or mental capacity. Click the Purchase button on your selected product page. You can pay online by debit or credit card or you can select to pay against invoice. If you wish to purchase multiple products and/or require delivery outside the UK, email sales@infolaw.co.uk for a quotation. Purchases are subject to VAT as applicable and to delivery charges outside the UK.